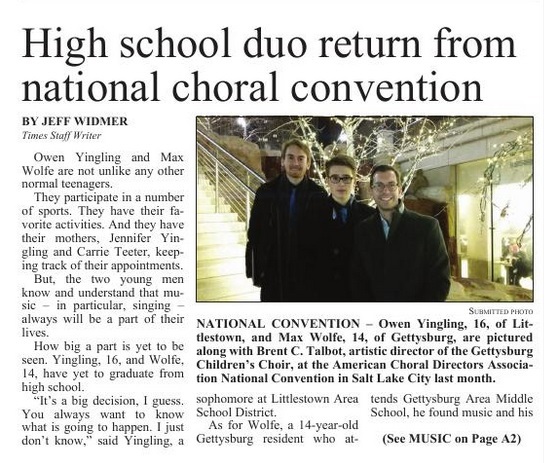 Owen Yingling, Littlestown High School, and Max Wolfe, Gettysburg Area Middle School, were selected to participate in the National Honor Choirs of the American Choral Directors Association in Salt Lake City in February, 2015. Guest conductor for the High School Honor Choir was Andre Thomas and guest conductor for the Junior High Honor Choir was Bob Chilcott. Dr. Talbot will be on sabbatical in Bali, Indonesia, for the fall semester. The Choir has announced interim directors. Dr. Talbot will return in December. Matt Carlson is the interim director of the Children’s Choir. He teaches high school chorus and fourth grade general music in Bermudian Springs School District in York Springs, PA. He is a graduate of the Sunderman Conservatory of Music at Gettysburg College with a B.S. in Music Education. A frequent performer Matt has sung with the Gettysburg College Choir and Camerata, played percussion in the Wind Symphony and Jazz Ensemble, and was the assistant director of Gamelan Gita Semara, Gettysburg’s gamelan ensemble. Matt also studied conducting with Dr. Robert Natter, served as Assistant Director of the Gettysburg College Choir, and interned with the Gettysburg Children’s Choir. Eric Dundore will serve as director of the High School Vocal Ensemble. He is a retired vocal music teacher with twenty-two years as the Director of Vocal/Choral Music at Mechanicsburg Area High School, where he conducted the Concert Chorale, Mixed Chorus, Wildcat Singers and the Spring Musical production. Eric has also been the Director of Music at St. Paul’s U.C.C. in Mechanicsburg for the last 31 years. He currently directs the Men’s Chorus at Bethany Village in Mechanicsburg. Mr. Dundore holds a Bachelor of Music Education degree from Lebanon Valley College, where he studied with Pierce Getz and Ronald Burrichter. He has done additional graduate work at Westminster Choir College, the Peabody Conservatory and Hartt College of Music, studying with Joseph Flummerfelt, Paul Hill and Gregg Smith. 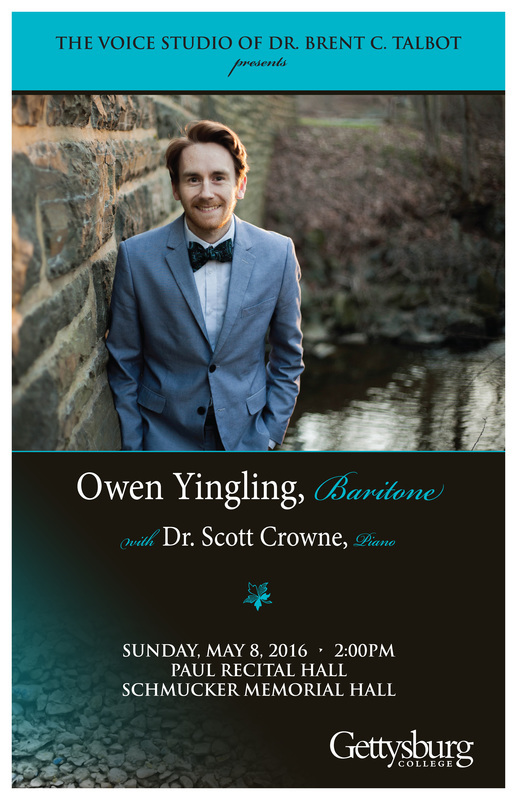 Eric served as Artistic Director of the Chamber Singers of Harrisburg and the Lebanon County Choral Society. He is a frequent musical director/stage performer with Theater Harrisburg. He served three years on the Pennsylvania Council on the Arts Opera/Choral Panel, the PA Board of the American Choral Directors Association, and is a past President of the Cumberland County Music Educators Association. 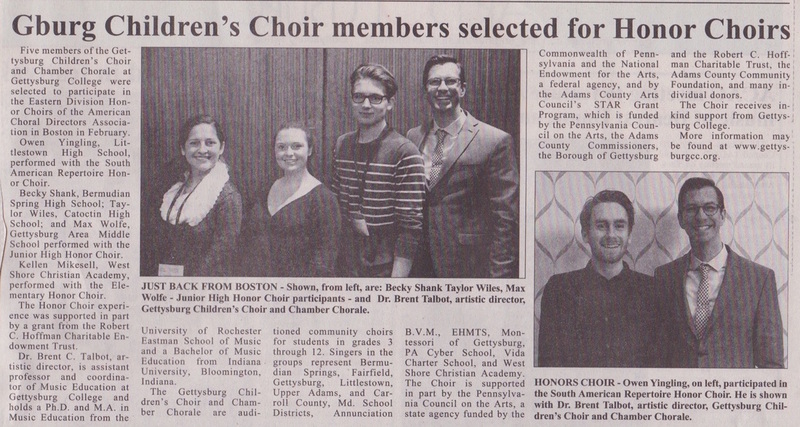 Three Gettysburg Children's Choir members were selected for the ACDA Regional Honor Choirs in Baltimore in February, 2014: Lucy Pratt, Gettysburg Area High School for the High School Honor Choir; Max Wolfe, Gettysburg Area Middle School, and Owen Yingling, Littlestown High School for the Junior High Honor Choir. Guest conductor for the High School Honor Choir was Jo-Michael Scheibe, chair of the Thornton School of Music Department of Choral and Sacred Music at the University of Southern California, and guest conductor for the Junior High Honor Choir was Jeffrey Ames, director of choral activities at Belmont University. 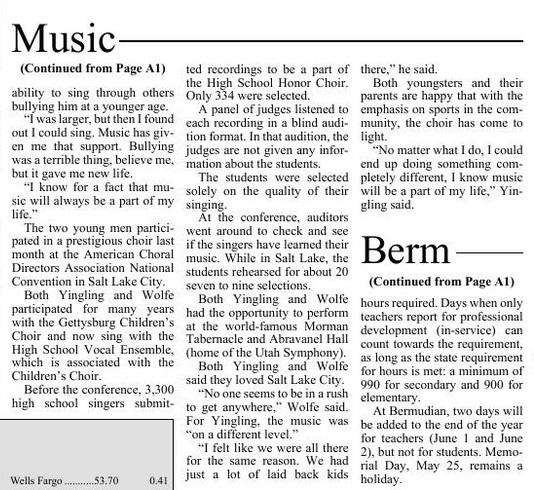 Grant Sanders, grade 9, and Owen Yingling, grade 8, were accepted into the ACDA National Junior High Honor Choir. The Choir will perform in Dallas, TX, in March, 2013. Four students from the Gettysburg Children's Choir participated in the thirteenth annual Baltimore Boychoir Festival hosted by the Maryland State Boychoir in May, 2012. Joshua Larkin, St. Francis School; Maxwell Wolfe, Lincoln Elementary School; Arjun Guidroz and Michael Kiehl, Gettysburg Area Middle School joined other participants including The Newark Boys Chorus, Newark, New Jersey; The Georgia Boychoir, Atlanta, Georgia; The Boychoir of Ann Arbor, Michigan; and The Maryland State Boychoir , Baltimore, Maryland. Guest conductor was Dr. Paul Rardin, Temple University. On August 7 and 8, three members of the Gettysburg Children’s Choir participated in the select Junior High Honor Choir sponsored by the American Choral Directors Association of Pennsylvania at their annual summer conference at Pennsylvania State University. The participants were Gisele Betances, Grant Sanders and Kelsey Wendell, all students at Gettysburg Area Middle School. Guest Honor Choir conductors were Margaret Jenks, director of the Madison, Wisconsin, Youth Choir, and Randal Swiggum, director of the Elgin, Illinois, Youth Symphony.